My Brother Joe's house. Re-roofed by In2GutRs in Storm Gray Malarkey Windsor. Equally as important as our seamless aluminum guttering is having a roof that properly channels the flow of water to those gutters without leaking into your house and causing hundreds or even thousands of dollars in damages. It is important to In2GutRs to provide our customers with high quality roofing products that we feel carry the same weight of integrity as our guttering products. In2GutRs offers both commercial and residential roofing repair services and new construction/ installation work. In the event that your roof needs emergency servicing, we are only a phone call away and will offer a free estimate on any roofing job. Our goal is to provide you with the very best roofing service on the market. 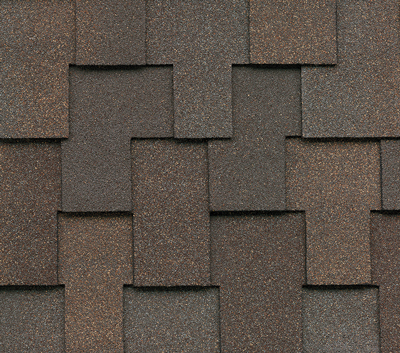 An example of a laminated architectural shingle such as Highlander or Legacy. This color is Heather. What makes a Legacy roof a little bit more expensive, but a lot a bit more special is 1) the extra 20 years of roof life, and 2) the impact resistance rating! This shingle is built to withstand the torture of extreme weather conditions, such as hail (it did on our house!) and insurance companies trust it so much, they will give you up to a 20% discount on your home-owners insurance just for putting It on your house. Over the course of time, a Legacy roof will not only will pay off the difference in price from a 30 year roof, it will pay for itself completely. An example of an Elegant Heavyweight Shingle such as Malarkey Windsor. This color is Natural Wood. If you’d like to check out the Malarkey website for more information, Click here.